NEW SMYRNA BEACH, Fla., Nov. 21, 2018 – The annual Plein Air Paint Out brings nationally recognized artists to New Smyrna Beach each year to create outdoor paintings from dawn to dusk over a span of a week. This year’s eighth annual event will be held Dec. 2-8, with proceeds benefitting the Marine Discovery Center. Approximately 31 professional artists from throughout the nation are invited to participate. At the end of each day during Paint Out week, the artists’ work will be brought to the Marine Discovery Center (MDC) at 520 Barracuda Boulevard in New Smyrna Beach. The artistic creations will be on display most days throughout the week in a gallery area at MDC from 9 a.m. to 6 p.m. Please check NSBPaintOut.com for daily gallery hours. The public is encouraged to view and purchase the work on exhibit all week long during the Paint Out. There will be nine daily art demonstrations in which the artists set up their easels to teach as they paint in different outdoor locations throughout the city. Art demonstrations will be held each day of the Paint Out event from 10 a.m. to noon, and from 1-3 p.m., unless otherwise indicated. The public is welcome to observe the artists at work and ask questions while they work. *Monday, Dec. 3 – (morning) Riverside Park at 105 South Riverside Drive under bridge, and (afternoon/painting) Outriggers Tiki Bar and Grille deck at 248 North Causeway Blvd. * Tuesday, Dec. 4 – (morning/sketching) at Florida Hospital Deck, South Parking Lot, at 401 Palmetto Street, and (afternoon) at Riverpark Terrace Restaurant at 302 South Riverside Drive. * Wednesday, Dec. 5 – (morning) Night Swan Bed & Breakfast at 512 South Riverside Drive, and (afternoon/painting) Smyrna Yacht Club Tiki Hut at 1201 South Riverside Drive. * Thursday, Dec. 6 – Art lecture on the history of Plein Air Painting and Painting Methods at MDC from 9:30-10:30 a.m., followed by art demonstrations by middle school students (morning) from 10:30 a.m. to 1 p.m., on the MDC campus at 520 Barracuda Blvd., and an artist demonstration (afternoon) at Buena Vista Park at 550 North Causeway. 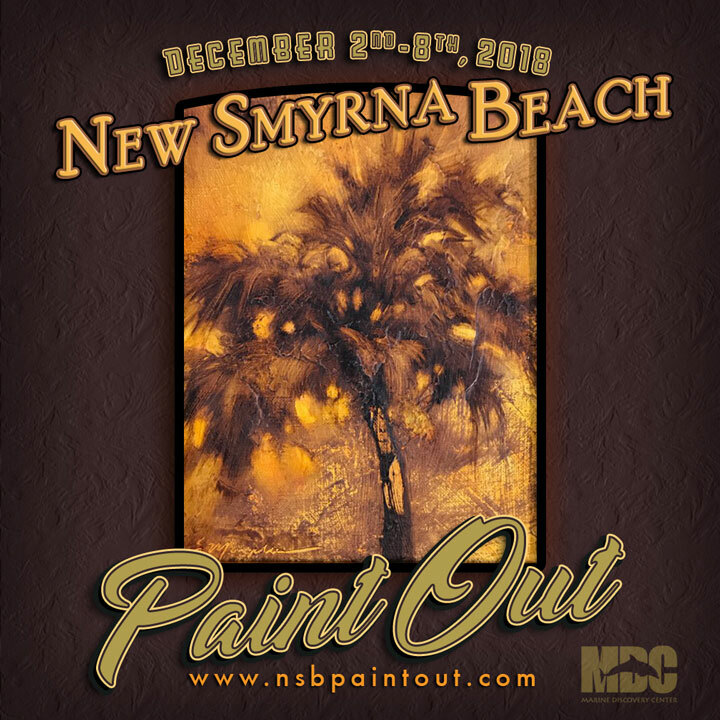 * Friday, Dec. 7 – (morning/painting) entry area of Outriggers Tiki Bar and Grille at 248 North Causeway, and (afternoon/painting) across from the New Smyrna Museum of History at 120 Sams Avenue. A “Community Quick Draw” event will be held from 10 a.m. to noon on Saturday, Dec. 8, at The Artists’ Workshop on Barracuda Blvd., next door to MDC. The event is a two-hour judged art competition for amateur artists and the public is encouraged to participate. An entry fee of $25 will be charged for each artist, with the winner invited to participate as a guest artist at the 2019 Paint Out. A highlight of the week is a special live auction of artistic creations on the evening of Wednesday, Dec. 5. Hosted by Outriggers Tiki Bar & Grille on the North Causeway, the preview of the exhibited art will begin at 6 p.m., followed by the live auction of the work at 7 p.m.
One hundred percent of all proceeds from the live art auction will benefit the Marine Discovery Center, while 50 percent of all other art sold during the week will benefit the educational programs at MDC. “This event truly showcases the Indian River Lagoon and our coastal community through artistic interpretation,” said MDC Executive Director Chad Truxall. The weeklong Paint Out will conclude and final art sales will take place at the Plein Air Gala on Saturday, Dec. 8. The event will be held from 6-9 p.m., in a special events tent located at the New Smyrna Marina at 200 Boatyard Street, adjacent to Outriggers Tiki Bar & Grille on the North Causeway. Tickets to the Plein Air Gala are $40 in advance or $75 for two tickets. Tickets may be purchased online. Art patrons and Paint Out sponsors support the event financially, allowing proceeds to benefit the Marine Discovery Center. For more information about sponsorship, contact Mary Sue Weinaug at 407-463-3363. Contacts: For media information Lisa Mickey at lisa@marinediscoverycenter.org; for other general information, Mary Sue Weinaug at 407-463-3363.